One lesson came when we had our first meal at a Michelin-starred restaurant. It was at Le Cep in Beaune, in the heart of the Burgundy wine country. The meal started at 8pm and went on until almost midnight. Course after course of wonderful food arrived. We were stuffed! And then they wheeled out the cheese cart. 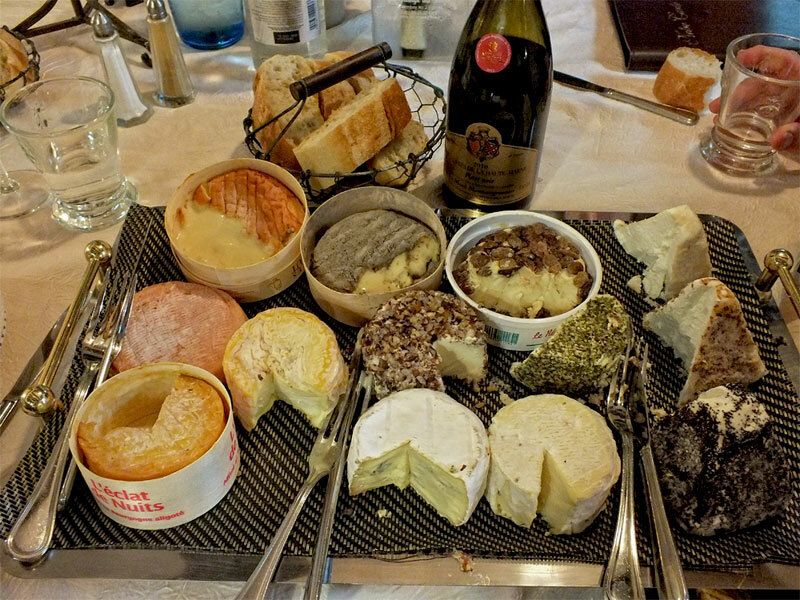 This was our first experience with a cheese course and Le Cep’s cart was enormous. It looked like an aircraft carrier! There were dozens of different cheeses, beautifully arranged. But without labels. The waiter indicated that we should choose what we would like. We were flummoxed, as our knowledge of cheese was quite limited back then – Monterey Jack, Cheddar and Parmesan pretty much covered it. Luckily for me, the lady always chooses first in France. I could let Val sort it out and follow her lead. Val, always clever, explained that we were new to this game and would the waiter please recommend a nice selection? Which he kindly did, choosing seven cheeses and making a circle of them around the edge of her plate. He told Val that she should start with number one and work her way around to number seven. I should have known better. Have you ever eaten Époisses? It’s usually described as “pungent” – now there’s a word! It is so strong that it sears the inside of your mouth. You can’t taste much of anything after you eat it. Yes, cheese number seven was an Époisses. Definitely not something to take a big bite of. But as I blissfully went ahead and started chewing, my eyes began to water and I urgently looked for a way to spit it out. But here we were in Le Cep, an elegant Michelin-starred restaurant and that’s just not done. So I wiped my eyes and kept going while Val covered her mouth and giggled. I love Époisses today but let’s just say it’s an acquired taste. And I had not yet acquired it. Another lesson was during the election for the European Parliament. About a dozen political parties had slates of candidates running. The conservative party had a televised rally to fire up the troops and get out the vote. We decided to watch it, figuring it would give us insight into the important political issues of the day. Plus it would be good for our French. Most of the speeches were boring, with the usual applause lines. There were shout-outs to dignitaries in the audience, potshots at the competition, promises to lead France boldly into the future. The crowd clapped politely but there wasn’t a lot of real enthusiasm. Suddenly, the crowd went wild, cheering and stamping their feet, throwing things in the air. It was like Charles de Gaulle had just liberated Paris. It is in the most unlikely places that you learn what moves French hearts. A few days later the results came in and the conservative party was the big winner. They far outperformed the pre-election polls. Lesson #2: Never underestimate the power of cheese. Keith Van Sickle splits his time between Silicon Valley and Provence. He is the author of One Sip at a Time: Learning to Live in Provence; Read more at Life in Provence. If you enjoyed this article, subscribe now to receive more just like it. Thanks for dropping by! Join us on Twitter or Facebook and stay updated by subscribing to our RSS feed or Newsletter. © 2019 The Good Life France. All rights reserved.